A circuit breaker in which uses sulfur hexafluoride or SF6 gas as arc extinguished medium is known as SF6 circuit breaker.SF6 is a very good dielectric material which can resist high potentials.SF6 gas is used as the arc quenching medium.Sulfur Hexaflouride (SF6) is an electro-negative gas and has a strong tendency to absorb free electrons. Whenever circuit breaker opens it's contacts an arc will form between the two contacts at the same time with high pressure SF6 gas will be rapidly pumped on the arc.The conducting free electrons in the arc are rapidly captured by the gas to form relatively immobile negative ions.The SF6 circuit breakers are very effective for high power & high voltage operations. SF6 circuit breaker consists of fixed and moving contacts enclosed in arc interruption chamber.which contains SF6 gas.This arc interruption chamber is connected to SF6 gas reservior. When the contacts of breaker are opened, the valve mechanism permits a high pressure SF6 gas from the reservoir to flow towards the arc interruption chamber. The fixed contact,moving contact are hollow cylindrical arrangements. The moving contact contains rectangular holes in the sides to permit the SF6 gas to let out through these holes after flowing along and across the arc. The tips of fixed contact, moving contact and arcing horn are coated with copper-tungsten arc resistant material. Since SF6 gas is costly, it is recycled & reused by suitable auxiliary system after each operation of the breaker. In the initial position of the breaker, the contacts remain surrounded by SF6 gas at a pressure of about 2·8-3.2 kg/cm2. The working of SF6 Circuit Breaker of first generation was quite simple it is some extent similar to air blast circuit breaker. Here SF6 gas was compressed and stored in a high pressure reservoir. 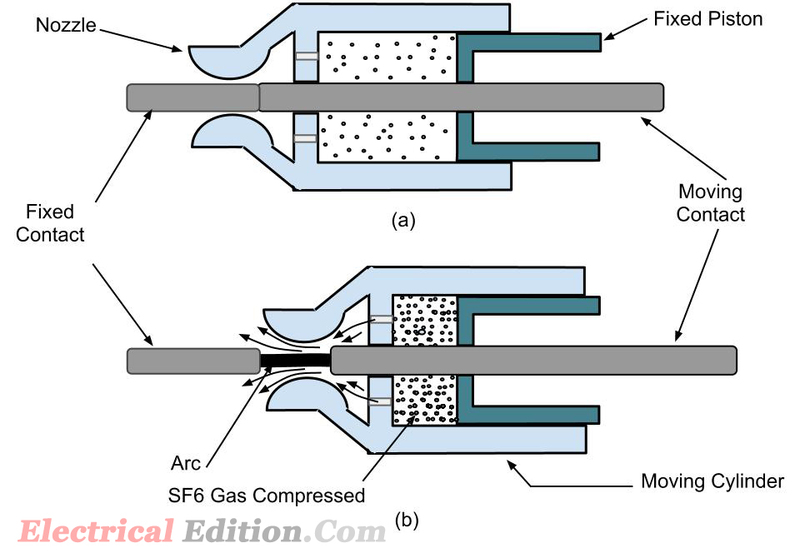 During operation of SF6 circuit breaker this highly compressed gas is released through the arc in breaker and collected to relatively low pressure reservoir and then it pumped back to the high pressure reservoir for re utilize. The high pressure flow of SF6 rapidly absorbs the free electrons in the arc path to form immobile negative ions which are ineffective as charge carriers. The result is that the medium between the contacts quickly builds up high dielectric strength and causes the extinction of the arc.After the breaker operation, the valve is closed by the action of a set of springs. (i) Due to the superior arc quenching property of SF6, such circuit breakers have very short arcing time. (ii) Since the dielectric strength of SF6 gas is 2 to 3 times that of air, such breakers can interrupt much larger currents. (iii) The SF6 circuit breaker gives noiselss operation due to its closed gas circuit and no exhaust to atmosphere unlike the air blast circuit breaker. (iv) The closed gas enclosure keeps the interior dry so that there is no moisture problem. (v) There is no risk of fire in such breakers because SF6 gas is non-inflammable. (vi) There are no carbon deposits so that tracking and insulation problems are eliminated. (vii) The SF6 breakers have low maintenance cost, light foundation requirements and minimum auxiliary equipment. (viii) Since SF6 breakers are totally enclosed and sealed from atmosphere, they are particularly suitable where explosion hazard exists e.g., coal mines. (i) SF6 breakers are costly due to the high cost of SF6. (ii) Since SF6 gas has to be reconditioned after every operation of the breaker, additional equipment is requried for this purpose. A typical SF6 circuit breaker consists of interrupter units each capable of dealing with currents upto 60 kA and voltages in the range of 50—80 kV. A number of units are connected in series according to the system voltage. SF6 circuit breakers have been developed for voltages 115 kV to 230 kV, power ratings 10 MVA to 20 MVA and interrupting time less than 3 cycles. Tags:SF6 Circuit Breakers,SF6 Circuit Breakers working,SF6 Circuit Breakers construction.